Larger banks, bound to strict government regulations on money laundering and customer verification, have mostly avoided putting their reputations at risk by getting involved with the cryptocurrency industry. As a result, smaller banks are quietly filling the gap and catering to the demands of the operators in this nascent ecosystem. In the United States, as big institutions are shunning the virtual asset class, it appears only a few banks were willing to serve cryptocurrency companies. The list of institutions that are offering their customers premium crypto-focused banking solutions includes Metropolitan Bank, Silvergate Bank, Cross River Bank, and Signature Bank. Indeed, the latest financial results published by those banks are refreshing for crypto enthusiasts among bankers, as these small lenders have generally been turning away their involvement with cryptocurrency companies into serious money-makers. The pro cryptocurrency banks have doubled their profits, revenues and asset holdings, their recent filings with the SEC show, and they explicitly acknowledge that their upbeat performance is primarily due to cryptocurrency driven business. In this article, we will take two SEC-reporting banks as examples of how landing cryptocurrency customers has propelled the small lenders to its best year ever. Founded in 1999 and headquartered in New York, Metropolitan Bank is a community-focused bank that has recently added to its clients’ roster a handful of cryptocurrency exchanges. It has also lured hedge funds, family offices and other institutional investors that want to invest in crypto but can’t get their primary bank. According to reports from the three-branch lender and the Securities and Exchange Commission, the crypto business is a proven lucrative niche for Metropolitan. What’s more, the last year’s performance was a staggering amount of growth when compared with that of the banking industry as a whole. For instance, while non-interest income for US banks rose a measly four percent in the first quarter, Metropolitan reported more than 300 percent increase from the previous year. Before we delve into the details, we should note that Metropolitan and other pro crypto banks only handle fiat transactions for their exchange clients but don’t deal directly into crypto assets. Cash management and FX conversion fees from cryptocurrency clients totaled $3.4 million in the first quarter of 2018. This helped drive a more than 300 percent increase from a year earlier. Non-interest income, a closely watched metric by investors, in the Jan-Sep period doubled to nearly $10 million, relative to $5 million in the previous year – also beating a four percent growth reported for the whole US banking industry. Net income in the third quarter went up by 86 percent year-over-year to $7 million, from $3.8 million in Q3 2017. On a year-to-date basis, the company yielded $19.2 million in profit compared to $9 million in the nine months through September 2018. Net income of US community banks rose 21 percent during the same nine-month period on an industry-wide basis. Deposits related to corporate crypto accounts amounted to $47.7 million and represented 3.1 percent of the total deposit base, while the settlement accounts amounted to $110.6 million and represented 7.2 percent of the total deposits. These figures are, however, lower than those reported at the end of 2017, where balances of crypto accounts were $95.4 million and represented seven percent of the total deposit base while the settlement accounts registered $213.2 million, or 15.9 percent of the bank’s assets. Average interest-earning assets increased $507.3 million year-to-date to $1.89 billion as compared to $1.38 billion for the same period in 2017. Average overnight deposits included $227.1 million related to settlement accounts of crypto clients. 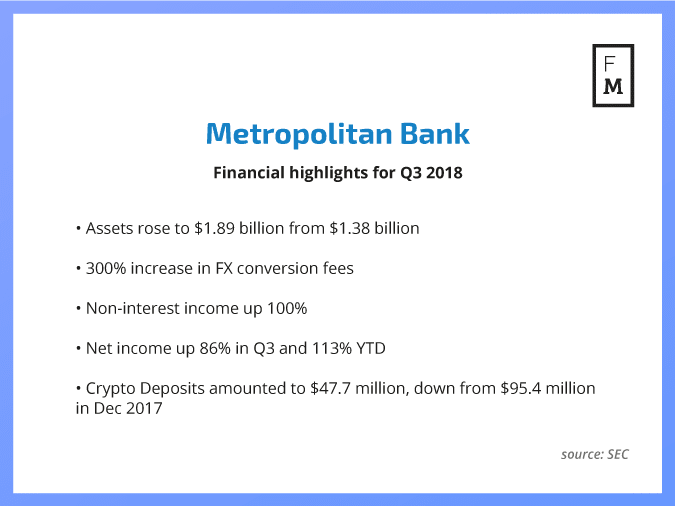 Metropolitan’s solid financial metrics, particularly in the bottom-line section, could be mostly explained by the low cost of deposits which was driven almost entirely by the expansion of their crypto customers. Silvergate Bank, located in San Diego, California is another prime example of how small lenders are showing signs of change in both attitude and business protocol, and how they became more welcoming of cryptocurrencies. Due to the long-standing passion of its CEO, Silvergate is arguably the leading bank for crypto startups in the U.S. The local three-branch lender has opened up nearly 500 accounts for crypto-linked companies, including big US exchanges such as Coinbase, Paxos, bitFlyer, Gemini, and Kraken – a move that made its assets shot up last year from $978 million to $1.7 billion. 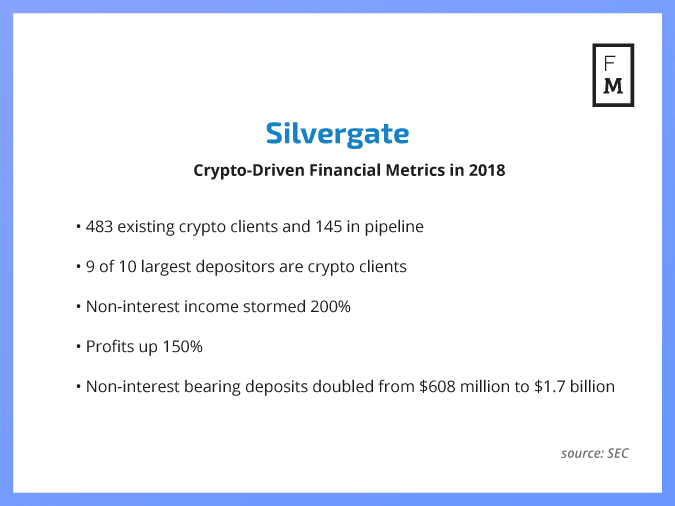 As of September 30, 2018, Silvergate has 483 crypto clients and another 145 prospective customers enrolled with a long waiting list, subject to onboarding diligence process that includes regulatory compliance checks. Nine of the bank’s ten largest depositors were crypto clients who accounted for $1.1 billion in deposits, or approximately 56.2 percent of total deposits. Relative to a rather uneventful 2017, Silvergate’s non-interest income stormed higher to $5.6 million in the nine months through September 2018 vs. just $1.9 million in the same period a year ago. If that doesn’t sound like a lot of money, keep in mind that Silvergate is a community bank with less than $2 billion in total assets. The bank also achieved healthy growth in its overall profit, having yielded $14.3 million in the January-September period, which is nearly a triple-digit rate of growth when weighed against $5.7 million the year prior. The record bottom-line metrics were the product of higher non-interest bearing deposits, which nearly doubled from $608 million in 2017 to $1.7 billion this year. The figure represented 88 percent of total deposits, while assets of crypto customers totaled 41 percent of the bank’s overall deposits (held by approximately 35 exchanges). Silvergate, however, acknowledges that the unstable nature of crypto markets could adversely impact its business growth at any time. This may include a drop crypto clients’ deposits, onboarding new accounts or loss of existing customers. Interestingly, Silvergate’s astronomical performance bucks the trend of the crypto bear market itself. For example, from December 2017 to September 2018, when the price of Bitcoin and other altcoins, as well the overall market cap, lost more than 70 percent of its value, Silvergate’s crypto clients increased their deposits by $273.7 million, up 21 percent year-over-year. The bank explains that the climb in crypto assets came primarily from new accounts, which deposited $831 million, partially offsetting decreases in deposit balances of existing customers. Silvergate Bank is now pursuing an initial public offering on the New York Stock Exchange (NYSE) as it plans to raise $50 million. Silvergate and Metropolitan are not the only banks taking the opportunity to capture a share in the emerging market of cryptocurrency-related businesses. Cross River Bank, in New Jersey, also provides services for more than 250 cryptocurrency companies, including some of the largest exchanges. This includes settlement and treasury management services for the cryptocurrency exchange Coinbase. Signature Bank is another community bank that powers some of the most well-known Fintech and cryptocurrency startups in the United States. Furthermore, the trend of small banks backing digital currency firms isn’t only limited to the United States. Over the last couple of months, a handful of small lenders in Europe were also following suit, even going as far as offering a dedicated banking service for this sector in an attempt to resolve its financial inefficiencies. Thus, smaller lenders like Falcon and Vontobel in Switzerland as well as Fidor in Germany and Bank Frick in Liechtenstein have embraced the crypto market, offering a catalog of useful products and earning huge revenues. The higher profits, coupled with banks executives’ rosy outlook, were welcome news for investors, who were watching the results closely amid a year of stock-market turbulence. In other words, with such considerable increases in assets and skyrocketing profits – now we have facts, not only speculation – other banks may not have the luxury of ignoring the crypto world anymore.